Grasp set of dumbbells using a neutral grip (palms facing inward), position the dumbbells at the top of your thighs and sit down at the high end of decline bench. Secure your legs/ ankles at the padding, slowly lay back on the bench and bring up the dumbbells straight up above your lower chest. Rotate the dumbbells forward so that the palms of your hands are facing your feet. This will be your starting Decline Dumbbell Bench Press position. As you inhale start lower the dumbbells in controlled manner until the dumbbells stand right to the sides of your lower chest with your upper arms and forearms creating a 90-degree angle. From this position bring the dumbbells back up to the starting position as you exhale. Contract the pecs at the top, hold for a second and repeat the movement for desire reps.
To prevent yourself from injury and achieve maximum development in your lower pecs set the bench to an angle between 20-30 degrees. Any lower inclination will overload your rotator cuff and reduce the work of pectoralis muscles. Move the dumbbells in a slight arch trajectory, this would help you to get good stretch at the bottom and better contraction at the top of the movement. Do not touch the dumbbells at the top, keep them about 5- 10 cm. apart, this would help you to keep constant tension on the pectoralis muscles and will lead to a better development. Keep the elbows pointed outward and don’t lock it at the top of the movement to keep the tension in the chest muscles. Concentrate on keeping the dumbbells fully balanced and under control during the movement, perform the negative phase twice longer than the positive. If you use heavy weights don’t bring down the dumbbells lower than the point in which the angle between your upper arm and your forearm is 90-degrees. This will overload your rotator cuff and can lead to overstretch or rupture in chest muscles. 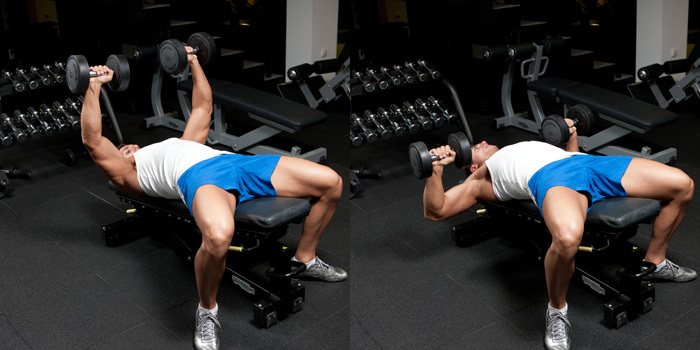 For your heavy sets use a partner to pass you the dumbbells at the beginning of the set and remove them at the end.